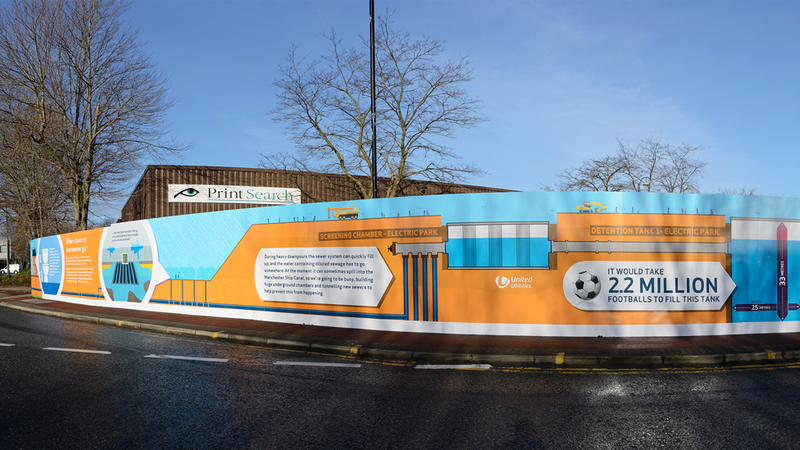 Our hoarding design maximised prime location and scale to tell a positive story that reached thousands. Our client provides water and sewage services to over seven million people in North West England. The impact on the community is clear from some of their figures: over 42,000 km of water pipes; more than 76,000 km of sewers, 569 wastewater treatment works, and more. As part of improvement works in the North West, and conscious of the potential disruption to people’s daily lives, our client was keen to inform and educate their customers on why large-scale operations are essential. The most effective way of telling this particular story was through an eye-catching hoarding design. 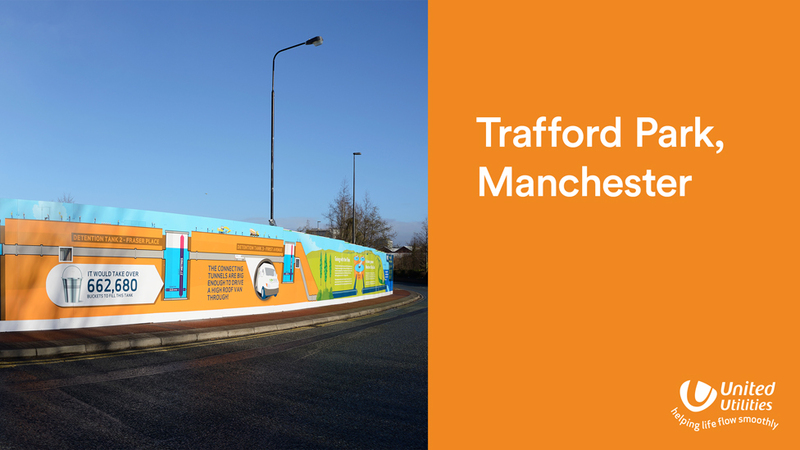 The hoarding design we produced at the Trafford Park site for United Utilities was especially high profile because of its location (the area is home to Manchester United’s football ground), and scale. Maximising the opportunity created by the location and size, we worked closely with our client and one of our professional copywriters to tell the United Utilities story. Lots of match day footfall meant we could go into greater detail with the story, which, combined with striking hoarding design, made a real difference to the impact of the messaging. After performing a site visit to survey the environment and setting, we created all artwork, graphics and illustrations to bring the story to life. Our client’s fresh brand colours are applied to playful and informative illustrations, really helping bring a mainly underground world to the fore of people’s minds. The tone of voice is friendly and approachable, and maximises understanding of the complex process this vital resource goes through. Once the construction hoarding design was approved, we printed the design with lightfast UV inks onto weather-proof boards. We then sent an installation team to fit them to the compound hoarding – all 72m of it! 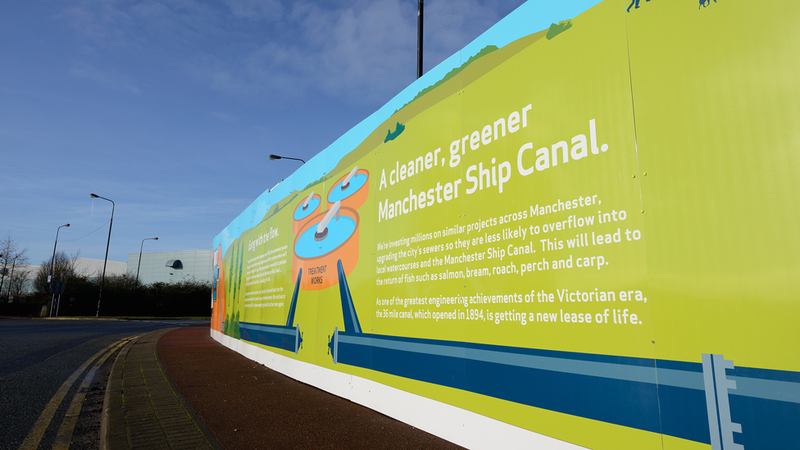 And then the story came together: by building on the Victorians’ legacy, and improving and extending the sewer network, a cleaner, greener future is secured for the Manchester Ship Canal. We have been working with United Utilities for a number of years on – amongst many other projects – hoarding design. As an experiential agency known for our outdoor marketing solutions, we turned a construction site into an engaging visual journey through time.